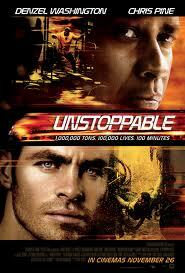 Starring Denzel Washington and Chris Pine (Captain Kirk in the Star Trek reboot of 2009), this action / disaster movie also stars a runaway train which threatens to reach havoc on the town of Stanton, Pennsylvania unless our heroes manage to stop it. Loosely based on a true incident, the story starts with an innocent but stupid mistake which evolves into a really, really big problem. It is almost as if we're talking about the butterfly effect where something simple like rolling a snowball down the hill sees it gain mass, gain speed and slowly turn into an avalanche. The story for the movie is loosely based on a real-life event which occurred on May 15, 2001 near Toledo, Ohio. An unmanned train consisting of 22 loaded cars and 25 empty cars traveled 66 miles (106 km) without incident before being stopped by railroad personnel. The gist of it is this. While switching cars, an engineer applied what is called a dynamic brake to his engine; this is likened to downshifting a truck or car. The engineer engaged the braking, moved the throttle into position number 8 then dismounted from his engine to deal with a manual track switch. Unfortunately what he didn't know was that he had misapplied the dynamic brake and the setting of the throttle had actually restored full power to the locomotive instead of stopping it. The engineer successfully changed the track switch manually but then was unable to re-board the engine as now, instead of having slowed down, it had actually sped up. As it continued, it reached a top speed of 50 mph (80 km/h). Like the movie, a second engine was attached to the end of the train to slow it down by dragging on the train. Another railroad employee was then able to board the main locomotive as the speed had been reduced to 11 mph (18 km/h) and stop the engine. In reading about this particular incident and the subsequent analysis of the why this happened in the first place, I have been given to understand that the rules are far more stringent than what occurred in this event. An engineer is not allowed to dismount or mount a moving train. In other words, before dismounting to operate a track switch, the engineer must bring the train to a full stop. I did not discover in my reading what disciplinary actions the engineer of this Toledo runaway may have faced afterwards. Wikipedia explains some of the background of the production and there, I discovered that Denzel Washington was paid $20 million. The budget of the whole film was apparently $100 million so minus Washington, that's still a lot of money. While I like Denzel, I can't say for myself that the addition of this actor really pushed the film over the top. Of course I know the studios are looking to get our attention with an actor's name on the marquee but in my opinion, a number of people could have done this and I would have been satisfied. Overall, the film was well filmed with good action sequences and well acted although most of the acting let's say was done by the central figure in the story: the train! Once again, I would like to stress to readers to verify the rating of a film before selecting what you're going to shell out your hard earned dollars to see. I'm a fan of science fiction and so my ears perked up when I heard about Skyline. I saw the preview and was intrigued but then discovered the rating from Rotten Tomatoes was 11%. [I burst out laughing] 11%? Heck, I want the movie theatre to pay me to see that. The film got a rating of 86% on Rotten Tomatoes. I would rate it myself as a good film but personally would advise you to wait for a rainy day. Rent the DVD or wait for it to be shown on TV. If you are going to go to the movies right now, some better choices would be Inside Job, Fair Game or Carlos, three films which are about actual events.